If Colin ate that cardboard cake, wouldn’t that be kind of like cannibalism? Fuuny comic though! I think it’s more of a meat joke. 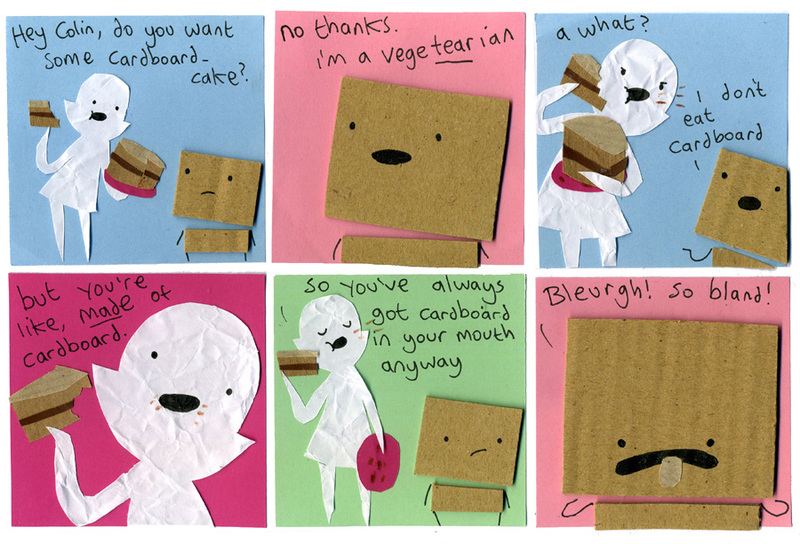 well, he says he’s a vege”tear”ian, and cardboard doesn’t easily, so…….. maybe he only eats stuff that tears? His cardboard tongue is so cute! But then . . . what DOES he eat? Packing peanuts? I imagine that’d be sort of like eating ants for him. “you’re made of meat, so why don’t you eat it”. Cardboard life is just natures way of keeping cardboard fresh! Wait, doesn’t that mean Pauline is eating a meat from someone else cake? or else she talks very slowly! Hey, just wondering if anyone else is seeing spam in the comic’s RSS feed? Ads for Windows and stuff. I’ve tried resubscribing but it doesn’t seem to get rid of it. Colin eating cardboard wouldn’t necessarily be cannibalism. We know that other species can be made of cardboard, such as Colin’s dog. Oh no! Is Pauline eating a cake made of Colin’s dog? I wouldn’t put it past her. I thought Colin ate cardboard in other comics. I love Pauline’s face when she’s shouting AND eating! COLIN!!! DON’T EAT THAT CARDBOARD!!!!!!!!!!!!!!!! !